When i first started the blog i posted a cute, quick tutorial on how to make easy pattern weights. As well as updating the blog over the next few weeks i wanted to also update my pattern weights and a few things in my sewing room. My old ones were getting really tatty and i had cut into them a tiny bit, oops! But the good thing is because you make them with scrap fabric you can change them up quickly whenever you want! I have been using Mending brackets. They were about 50 cents from the hardware store or i found this link online. They are awesome. Heavy enough and i like the long rectangles. I put them over the folded edges of fabric to keep that nice and flat while cutting the fabric. You could make these with any bracket (square or rectangle) by adding seam allowance + 1/8″ to each side and 1″ to the top side for top stitching. fold down the top 1/4″ and with right sides together sew from the folded top down the side, bottom and other side leaving the folded top open. Clip the bottom corners and trim the seam at the sides of the folded edge. Turn right side out. I use a loop turner for this. Top stitch 1/8″ across or close the hole with a slip stitch. Cute pattern weights! 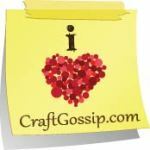 You’ll love using them and making your cutting table cute at the same time!